What Is Applique and How Is it Used in Quilts? Applique, used as a verb, is the process of sewing (or attaching in another way) smaller pieces of fabric onto a larger background. Templates are used to cut the patches. Applique, used as a noun, refers to a quilt or other project where pieces of fabric are already attached. Applique projects can be sewn by hand or by machine. Sewing the patches to a background is the traditional way to create a project but other methods can be used instead. You'll see applique used on all sorts of clothing, too. Kate Middleton's wedding dress and veil are examples of appliqued lace. Needleturn applique is a traditional hand applique method. Shapes (including a seam allowance are cut from fabric and pinned to the background. Quilters use the end of a sharps needle to turn under the seam allowance of each patch as they sew the patch in place with a blind stitch. Sew and turn applique is an easy technique that eliminates the need to turn under seam allowances before sewing shapes to a background. Two identical shapes are positioned right sides together and a seam is sewn all the way around the shapes (on the seam line). The quilter makes a slit in the material (fabric or something lighter-weight) that will end up on the reverse side of the pair before turning the motifs inside out. Shapes can be added to the background using any method. Fusible web applique, sometimes called iron on applique, eliminates the need for seam allowances. Instead, a thin sheet of sticky webbing is pressed onto the reverse side of the finished size of shapes. When the shapes are ready they are pressed to the background, sticky side down. It's best to hand or machine sew the edges of fusible web shapes to the background to keep them from curling away from the fabric, even if the brand you choose says that stitches aren't necessary. Quilters sometimes use freezer paper (available at the grocery store) to prepare their applique shapes. The paper has a shiny side that sticks to fabric when pressed. Cut oversize backgrounds for all types of applique because they tend to 'shrink' and become distorted as shapes are added. Square up the backgrounds after all pieces are in place. 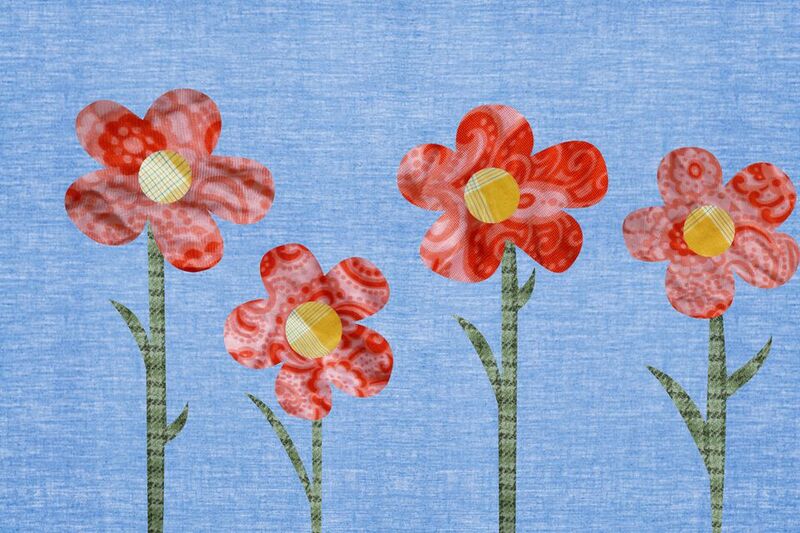 Any type of invisible or decorative stitches can be used to surround applique shapes.